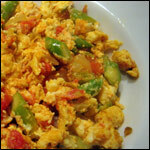 Here's all the recipes listed under Healthy Scrambles along with the comments posted by the breakfast lovers that submitted them. "Healthy, flavorful and filling. This recipe makes one large serving. Just 6 ingredients." "I made this one time, and it was pretty brilliant as far as taste is concerned. The combination of bulgur and the spices along with the rotel gives you a great wake up in the morning, whereas the fiber from the bulgur and the protein from the eggs and cheese provide for sustaining energy throughout the morning. 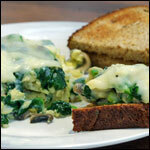 Tastes just as good with eggbeaters and lite cheeses and milk." 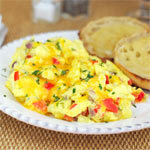 "This scramble is quick to prepare and full of flavor. Featured ingredients are bell pepper, onion, oregano and Cheddar cheese. Jalapeno optional." 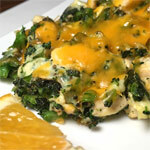 "You could sprinkle a bit of grated jalapeno jack cheese on this for a bit more kick. 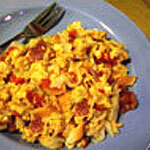 Diced onion and tomato are other optional ingredients." "You cold also add chopped peppers or mushrooms... whatever you like. But this is the version I usually make. The whole thing takes about 15 minutes." "I like this recipe made with egg-beaters and a sprinkle of cheese if I have any handy." 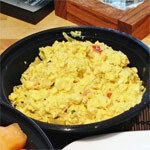 "Around our house, we call this recipe 'The Scramble' - it's our go-to, quick egg dish from a recipe that been handed down through our family for years." "This is very nice and flavorful, especially with a quality bread for toast." "This is a pretty easy recipe. It's filling and has only 5 grams of carbs. I hope you like it." "I am a professional fighter and I eat this food every morning to keep me going through my daily training. Try it, I personally guarantee that you will feel good all day, or your money back!" 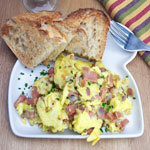 "This recipe was emailed to Mr Breakfast by a great Breakfast Lover named Elad B. It's easy to make and loaded with garden-fresh flavor." "A filling, delicious breakfast with only 330 calories." 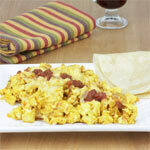 "This scramble has a lot of ingredients and a lot of flavor. It makes a good Mother's Day treat." "To garnish, consider topping with crumbled corn chips or French's french fried onions." 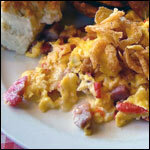 "What do you get when toss fresh ingredients in a skillet with some eggs and top it with a little cheese? A delicious breakfast every time." 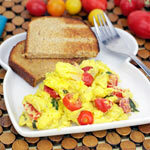 "A two-ingredient scrambled egg dish that's low in fat and calories and high in protein. 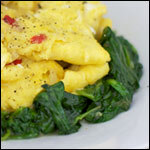 This recipe comes to us courtesy of Hungry-Girl.com - a site highly recommended by Mr Breakfast." 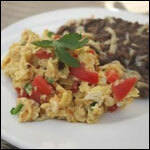 "A healthy, protein-packed alternative to ordinary scrambled eggs." "You won't miss the eggs at all thanks to the fresh flavors of bell peppers, tomatoes, onion and sesame seeds (or pumpkin seeds)." 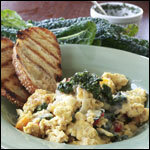 "A delicious scramble with Tuscan kale, ricotta cheese and other Italian flavors topped with a simple basil pesto. Buon appetito!" "A great way to increase your daily veggie intake and my two year old loves it!"